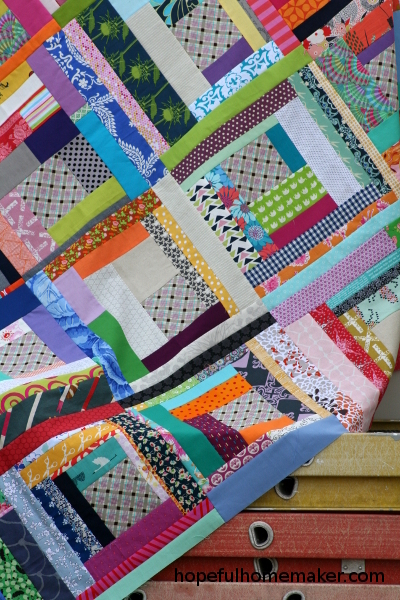 I’ve named this my Scrappy Friendship quilt. It’s a description of how it was made, but it also describes friendships. We all want to offer our best – all the time – and often we do. Yet sometimes all we have to contribute are scraps, and true friendship accepts scraps and turns them into something beautiful. We shouldn’t withhold our offering because we don’t think it’s good enough; friendship is offering and accepting what we have, knowing it will be helpful and appreciated. 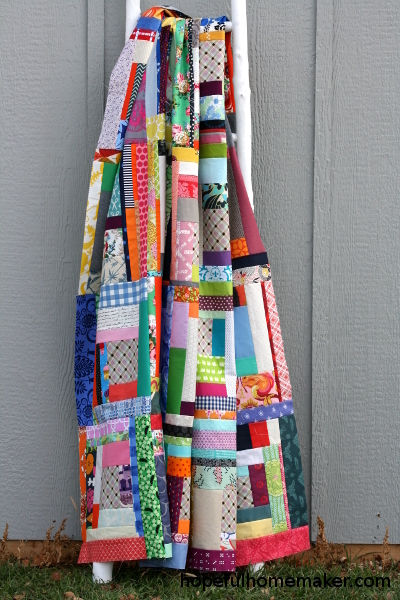 Scrap quilts are the same, and so it is with this one. I have one friend who likes collaborative quilting projects. 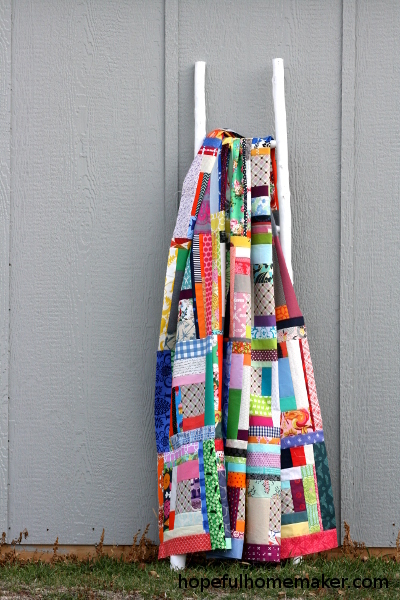 She got a half dozen of us together to pool our scraps and sew some quilts. For our collaborative scrap project, we each brought 24 squares of fabric, 5″ square, to use as the beginning of the block. Some of us brought solid fabric scraps; some of us prints. We set up our sewing machines in one room and each of us took someone’s stack of 5″ squares. We pulled a scrap from our own bag without worrying about matching or coordinating, and sewed it to one side of the square. Trim and press, and pass the blocks to the next person. In this way, we added to each other’s squares to make an improv block that was unique. We devoted two different evenings to our blocks, and then each of us took our blocks home, decided on the final size of the blocks, and finished the quilt. This meant trimming a little or adding a few more strips, and in my case, making one more block so I could have a 5×5 layout. 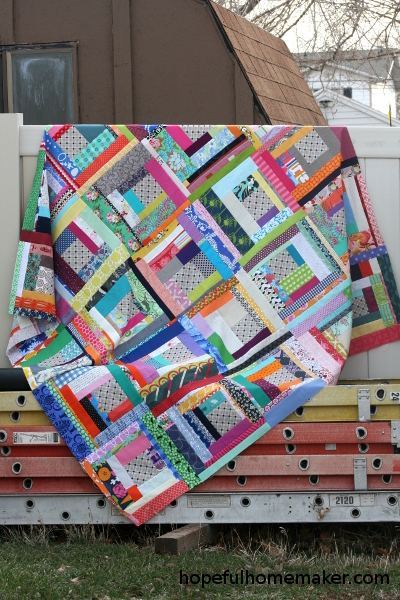 I had my blocks finish at 15″ square for a 75″ quilt. If you’re looking for a fun sewing project to do with friends, I recommend this idea. It’s also a great way to force yourself to try some improv and not worry about contolling the outcome, which is a good practice in creativity. When I see these blocks I see my friends. I see their styles and tastes, and I think about how much they push me to be better. They do it for me in my quilting, and they do it for me in life. 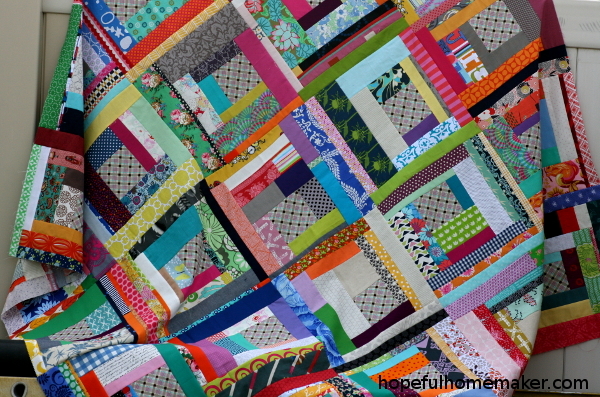 I am grateful to have a quilt with all of our fabric scraps thrown together.